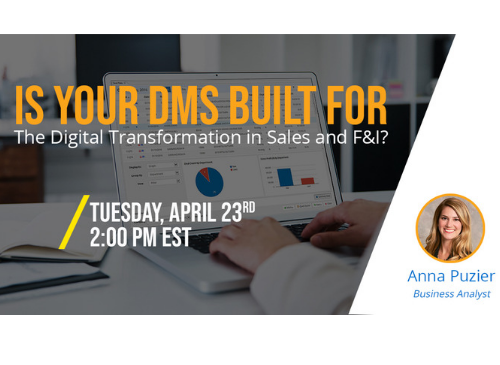 Is Your DMS Built for the Digital Transformation in Sales and F&I? Americans spend billions of hours waiting in line every year. Are your workflows in sales and F&I making their experience better, or worse? Dealers have been turning to technology to solve workflow and customer experience issues for many years. After all, it’s what the digital consumer expects. If your dealership is transitioning to a digital experience in sales and F&I, it’s important to take the time to assess your needs and understand the role your DMS plays in this major transition. Join us in this FREE Automotive News POWERtraining webinar, on Tuesday, April 23 at 2 pm EST/ 11 am PST. Sales and F&I expert Anna Puzier will provide several considerations dealerships must make when going digital.